The Americans with Disabilities Act (ADA) was signed into law in 1990. The ADA is a civil rights law that prohibits discrimination against individuals with disabilities in all areas of public life, including jobs, schools, and transportation. It prevents discrimination against a group that has historically faced many barriers. The ADA matters for any business because the law states that it is illegal to provide good or services to the public that are not also accessible to people who have disabilities. Not only that, there are over 60 million Americans with disabilities. The ADA impacts any business or government that is providing goods or services to the public. It is one of the most far-reaching pieces of legislation that the US has enacted. However, what is defined as accessible isn’t always clear cut so there can be some grey areas. How does the ADA handle websites and web accessibility? Currently the ADA does not explicitly address web accessibility. It has generally been up to lawyers to assess how the ADA applies to websites and online content. Having said that, the ADA is enforced by the U.S. Department of Justice (DOJ). And the DOJ has issued a Supplemental Advanced Notice of Proposed Rulemaking (SANPRM) to incorporate web accessibility into the ADA standards. These ADA guidelines for web access will continue to change over time and prevailing wisdom is that the ADA extends to online content. What happens if I’m not compliant with the ADA? Most complaints related to the ADA are generated by individuals with disabilities, their families or disability-rights organizations. There are times when the DOJ initiates an investigation but it is not common. If you receive an ADA related complaint to your organization you may get sued. It’s best to talk to your lawyer. It should also be noted that the ADA does not have a team of inspectors. It is up to businesses and governments to comply with its requirements proactively. What’s the best way for Podcasters to be ADA compliant? If you are a podcaster or you create audio lectures, you should provide a transcript of the words being said. The transcript should be accessible online or by download. What’s the best way for video producers to be ADA compliant? If your business creates videos those videos should have closed captions. Captions should be time-synced to the speech. You should also make sure you are using a media player that can be controlled by the keyboard. What is the least expensive and easiest way to make my website ADA compliant? Creating transcripts and captions manually is the least expensive way but not the easiest. 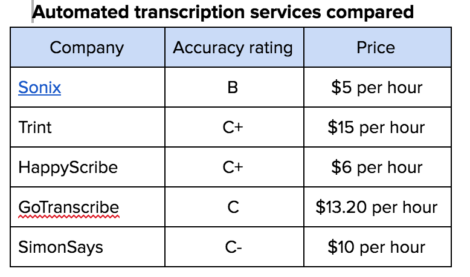 The easiest and least expensive way is to use an automated transcription service. What is automated transcription and captioning? Automated transcription is the conversion of audio and video into text using machines. There are several companies that provide this service. Below is a list of services ranked in terms of accuracy and price1.